Peter Possum is the newest member of the Tambo Teddy family. Tambo Possum is a Phalangeriformes, part of the family of marsupials’ native to Australia. Possums are iconic Australian fauna, they are incredibly agile, with a prehensile tip to the tail which can grasp branches as if they have another hand. Possums are not at all aggressive, and if their territory is threatened they prick their ears and try to stare out any invader. Our Peter is a rather shy character, but once he gets to know you he is full of fun and surprises. Although Possums prefer tree-dwelling, Peter the Possum is quite happy seeking out any nook and cranny around the house where he can curl up and sleep the day away. Peter is nocturnal but does love to come out and play at any time and being a possum puppet, he just loves putting on a show! Male possums are called Jacks and females, Jill, Tambo Teddy possums are called Peter and Pauline respectively. Possums favour eucalyptus, ferns, flowers, buds and fruits but will also eat insects, moths, grubs and snails. However, Tambo Teddy Possums are easy to care for and don’t need feeding so won’t decimate your garden. Creating Peter Possum has been fun, we were kindly sent a pattern by a lovely lady, Merelyn Saunders, who thought we might be able to use it at Tambo Teddies. We have been toying with the idea for a while and decided our jubilee year was the time to work on him and get Peter to market. The pattern had to be adapted and tweaked, Alison and Tammy started the process and made a couple of proto types and after several broken needles and wonky sets of ears, handed over to Verna for the final product polishing. We received over 450 ‘what’s in the box’ competition entries and there was a wide variety of ideas, from wombats to kangaroos, sheep and bilbies. There were only six people who guessed ‘possum’ and no one thought about a puppet, but there can only be four winners so the first four across the line received a Peter or Pauline prize. 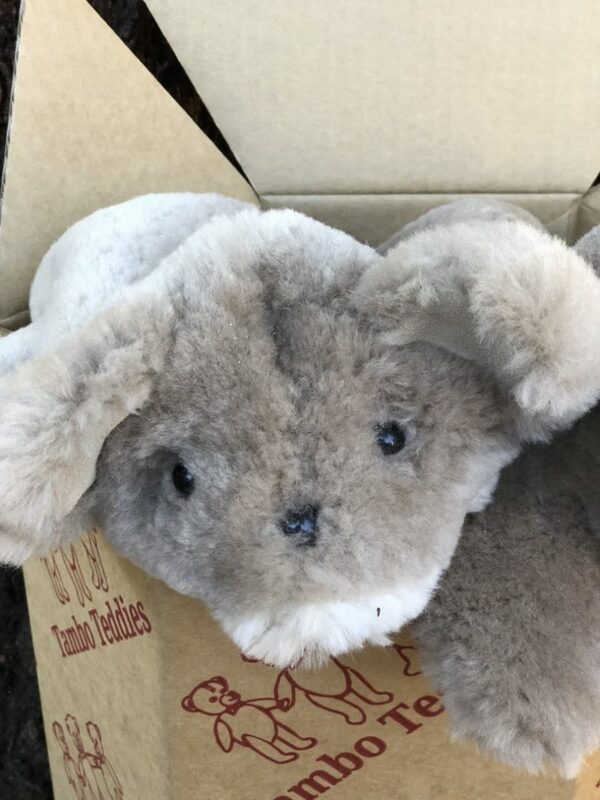 Peter Possum has been crafted from soft camel coloured sheepskin and has a soft cream belly, beady eyes and an inquisitive nose. Peter loves being a part of the Tambo Teddy family and would love to be a part of yours too.